“Content is king” is a phrase that gets bandied around the web an awful lot. I’ve written before about how content is no good without promotion, and I stand by that. But if you do promotion right and have a relatively established website, there are a few things you can do with your content that can help explode your traffic. And I don’t use that hyperbole lightly. Too many people fall into the trap of churning out blog content for the sake of it, without much thought and research, or without delivering on that research once it’s been done. Here’s how to stop that happening, and to create informational content that will truly shine and bring lots more people to your website, in a consistent way. The starting point for all effective content (that targets search traffic at least) is keyword research. You need to ensure you are writing pieces of content that target phrases and topics people are searching for. For this process, our focus is on informational content so you should be looking for the kind of things your audiences are searching for higher in the buying funnel before they reach the commercial queries that are more likely to directly convert. A great way to find this is looking for questions that people are asking about your topic. In this example, if I had a client who offered trips to Italy, I would put Italy in and see what comes back. I could then start typing in more specific locations like Rome or Florence and get another batch of ideas. You could then go the other way and broaden the search to Europe and see if you can capture some people who haven’t yet filtered down to Italy itself but could still be interested if your content is good enough to inspire them! Another great source of content inspiration is competitors. You can look at their blog and see the kind of articles they are writing, but you can also be more scientific and use Ahrefs to see what their best performing content is. Just plug in the URL of competitor domains, filter by top pages, and see how you should prioritize your content based on which of their pages are giving them the most visibility. In addition to sites that you consider direct competitors, do some research and find prominent blogs that focus on your niche, then carry out the same process as you did with competitors. Naturally, blogs will have more informational content, so if you can find an authoritative blog on your topic, it will likely be the source of lots of excellent ideas for informational content. One area that often gets overlooked when doing keyword research is the name of places and things. In travel, this is particularly prevalent as there are so many places to see and visit and good search interest for specific things. Often these kinds of things are overlooked in favor of more general phrases like “things to do in…” or “best time to visit…” but there is actually a lot of volume at the other end of the scale with very specific things. Phrases like “Palatine Hill” and “Catacombs of Rome” are largely ignored by the huge travel sites, so present a huge opportunity for smaller independent brands if they create content that is good enough. Once you have the right topic, the next challenge is structuring your content in the best way to actually then rank for the terms you’ve identified. Your piece should be the most comprehensive one about the subject matter on the web, so it’s highly likely it will be a long one. We recommend at least 2,000 words, but this can vary depending on the topic. Look at who is on Page 1 and ranking well and get a feel for whether that will suffice or if you can get away with shorter or need to go much longer. As well as length, there are a few other key areas we have found to making your content as effective as possible. Start your page with a good overview which gives a quick insight into what the page is about and what it will cover. This is effective in getting a featured snippet at the top of the search results when your content starts to rank prominently. As you are likely to have an extremely long page, a menu at the top of the page that jumps down to the various sections included is a good idea and gives Google more information to understand what the key areas of the page are. This menu should reflect the findings in your keyword research, with the headers matching the sub-topics that had good search interest around them. Images and video will make the page more comprehensive and also help to keep people on the page longer, which will impact your ranking performance over the longer term. It will also break up the swathes of text you have on the page and make it easier to consume for readers. Ensure you have a proper heading structure throughout, with the title as an H1 tag, and the key sections that your menu jumps to marked up as H2 tags. Within those sections then make headings H3 tags. This can also be extremely effective in achieving featured snippets in the search results. Here’s an important area that is often overlooked. One area that will naturally develop as you add more content to your site is internal linking opportunities. More content, more places to link to and from! As you are adding new pages to your site, be sure to link through to other relevant pages within the same topic area. For example, if we follow our Italy example, ensure that all pages about Rome link to other pages about Rome and that pages about Florence all link to other pages about Florence. As your site grows you will need to return to old content and link to the new pieces being added, and when you reach a point where you have a strong body of content it is good to do this in a structured way throughout the site so Google can recognize the pattern. Developing strong “silos” around your various different topics through the strong internal linking patterns will help Google understand all the content better and see you as more of an authority on the topic. That will help both the informational content rank better, and also the commercial pages that are closer to the bottom of the funnel. It should go without saying that your content needs to be amazing. Google wants to deliver the best results for users, so to be future proof you need to be confident that your page lives up to the bill. Look at Page 1 for the phrases you want your content to rank for and make sure that you create something better. It doesn’t need to be 10x better, just 2 or 3x better will do just fine. The main thing is that when a user finds it, they are satisfied and get all the information they could possibly want without going elsewhere. Below are some examples of sites sticking to these principles extremely well and benefitting from strong rankings and traffic improvement as a result. This pages covers all the points highlighted above and ranks on page 1 of Google for some of the most competitive terms in travel. An overview sentence at the start, internal page menu, then a video to encourage people to stay on the page longer. There is then a huge amount of content on the page, broken up effectively by well structured headings, media and other formatting. It’s also packed with internal links to supporting content and commercial pages, all of which also rank extremely well. This is a good example of the Places and Things recommendation above that we implemented for a client. We built out their content by developing lots of in depth pages around the key places that people visit Rome to see, and a wide variety of them rank extremely well as the quality of content produced by bigger, stronger sites is not up to scratch (because they are focusing on bigger keywords). This is a good example of an authoritative blog getting things right that you can use to inform your own content and find ideas. Journey Era has created epic content throughout the site, with a huge, in-depth article on things to do in Oahu. However, I believe the key to their performance here is the supporting articles that feature for every item included in the list. This creates a very strong silo around that post, and as a result, the main post and the supporting pages rank like crazy. You might be left thinking “it’s all well and good to get traffic through these informational pages, but I want to make sales.” And you’re right. It’s true that the chances of someone converting off a phrase like “Palatine Hill” compared to “Rome tours” aren’t as high. However, having more content around the topic of the commercial phrase will help it rank higher as well, as the examples above show. You should also do more to engage with the visitors coming through informational phrases so that they may buy something off you in future. It’s highly likely that many of those searchers are doing some research before they buy something in future, so if you can take this opportunity to show off why your brand is great then that will stand you in good stead when they reach the point of purchase. Feature some form of lead magnet on your informational pages so visitors have a reason to hand over their email address to you. You can then build a relationship with them via email, so when they are ready to buy something you are the first brand that jumps to mind. 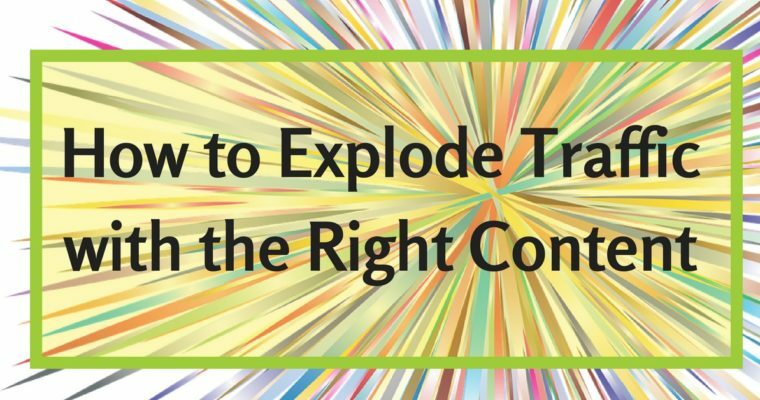 The title of this post focuses on exploding traffic, rather than conversions, and it’s true that there is some work to be done to take this increase in visitors and turn them into an increase in customers. However, there is no doubt that if you write great content around topics that are well searched for, structure it using the approaches above and then ensure you engage the users that land on your site, you will see an extremely positive return on that investment for your business. It takes time to develop that content, but it is both sustainable and far-reaching if you commit to it. The hardest thing is getting started, so take that first step and everything else will follow.